Masters of German clock making since 1922. Oakside are delighted to offer you the full range of Hermle Floor Clocks, Hermle Wall Clocks and Hermle Mantle clocks. Hermle enjoy an outstanding international reputation in the design and construction of their Grandfather clocks, wall clocks, table clocks, ship's clocks and regulators. Frank will be pleased to advise you about clock specifications and the Hermle & Oakside three year mechanical movement warranty. When buying a clock from Oakside you can rest assured that our many years of technical experience in clock making will be just a phone call away when you are installing and commissioning your new clock. You will receive the benefit of our specialist knowledge that isn't available from online multi-product discount warehouses! When you place an order for a Hermle clock, we contact Hermle and arrange for a factory fresh clock to be dispatched directly to your address; this ensures that you get a clock that is built to the very latest specifications. Delivery is normally within two weeks but when we receive your order or enquiry we will seek a delivery forecast from Hermle and advise you accordingly - should the forecast delivery date not be acceptable, we will immediately refund your full deposit. PLEASE NOTE that the Delivery forecast on our Hermle Clock Gallery is dependant on information provided by Hermle. We do our best to keep up to date with this information however, please be aware that clock availability at Hermle changes on a daily basis without our knowledge! SELF INSTALLATION. The shipping carton will hold the clock cabinet together with the Hermle instruction manual. All Hermle clocks are delivered completely assembled, the only exception where applicable - is that pendulum and weights are packed separately. Just follow the printed instruction which show how to hook on the pendulum and weights and you clock is ready to run. Please remember that you can always call Frank for advice, when installing you clock. 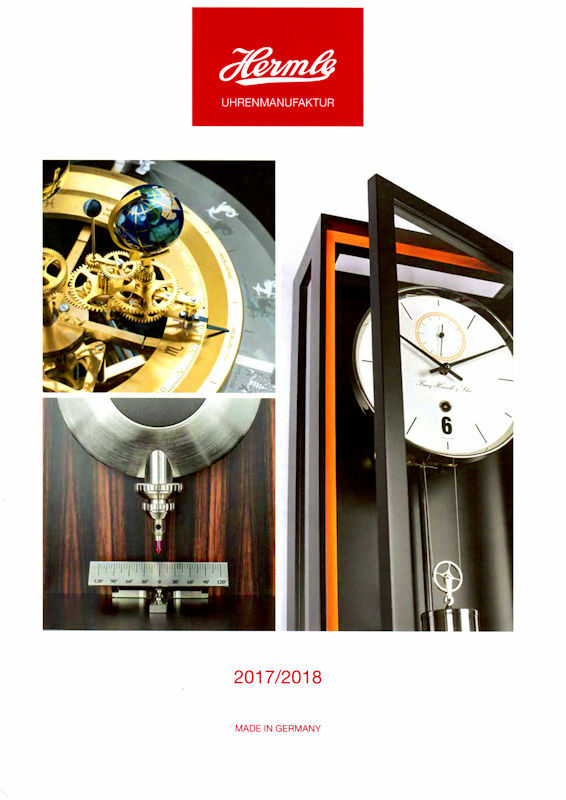 Click on the image on the left to view the Hermle 2017/18 Clock Catalogue in PDF format (2.95 MB). The clock descriptions are in English and German. If you have seen the Hermle clock of your choice at a lower price elsewhere, or you want to make a price offer, simply submit the Contact Oakside form with your details and price offer and we will do our very best to please! Our price includes VAT and delivery to your address PLUS the Hermle warrantee administered by Oakside Classic Clocks. Mechanical Month Running Precision movement. Fully glazed cabinet in satin black with bright metal trim. Fitted with the W-0761 movement. Delivery - In stock at Oakside. Click here to view the Hermle 70961-740761 Kingsland Clock Details Page. Click here to view the Hermle 70961-740761 Kingsland Options and Prices Page. Fitted with the Masterpiece movement. Click here to view the Hermle 01241-747761 Masterpiece Clock Details Page. The cabinet has bevelled front and side glass. Special regulator dial with separate hour, minute and second hand. The second hand makes ticks every minute. This clock is fitted with a Precision 31 day movement that incorporates a Harrison Dead Beat escapement with ruby pallets. Movement has 6 ball bearings and 6 ruby bushes to minimise friction. The beat or tick can be equalised with the precision screw on the pendulum shaft. Numbered edition shown in dial with quality certificate. Click here to view the Hermle 70875-160761 Greenwich Cherry Clock Details Page. Click here to view the Hermle 70875-160761 Greenwich Cherry Options and Prices Page. Impressive hand polished black case..
Click here to view the Hermle 70875-740761 Greenwich Black Clock Details Page. Click here to view the Hermle 70875-740761 Greenwich Black Options and Prices Page. Delivery - In stock at Hermle in Germany - delivery direct to your address, in about seven days. Click here to view the Hermle 70875-030761 Greenwich Walnut Clock Details Page. Click here to view the Hermle 70875-030761 Greenwich Walnut Options and Prices Page. Ruby bearings are enclosed in bronze châtons. Click here to view the Hermle 70988-747761 Masterpiece Clock Details Page. Click here to view the Hermle 70988-747761 Masterpiece Options and Prices Page.